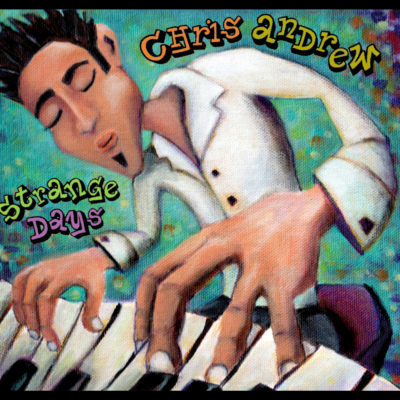 For Canadian pianist Chris Andrew, the title of his newest album; “Strange Days” is a reflection of a very personal and musical journey, that he has traveled over the past few years. As with most people, sometimes it helps to document their journey in some fashion to move forward. Instead of words, Chris tells us of his story in the language he speaks best, the language of jazz. In its own way, Chris Andrews ‘Strange Days’ takes us through the joys and sorrows, and triumphs and tragedies that we all have experienced at one time or another. From Chris we find inspiration in tracks such as ‘Beauty’, a joyful musical celebration for his daughter Jade, or reflection with ‘Craig’s List’, a song written in memoriam of long-time jazz supporter and friend, Craig McGill. Although each song on the album has its own story, Chris hopes that the listener can superimpose the music into their own lives to help reflect upon their own unique personal journey. For Chris, and hopefully for the listener, ‘Strange Days’ is an album of catharsis and growth, and most importantly the joy of discovery. Through ‘Strange Days’ we see one of Canada’s rising talents share his own personal journey through his music. Accompanying Chris on this musical voyage are some old friends and new. Brought together by his old friend, and master technician Ralph Bowen (OTB, Orrin Evans) on tenor sax, Chris is joined by a group of musicians considered by all to be contemporary jazz masters. Drummer Donald Edwards (Mingus Big Band, Mark Whitfield) brings a modern approach steeped in tradition. Grammy winning bassist John Benitez (Eddie Palmeiri, Danilo Perez) helps bring out Chris’ latin musical roots while still swinging strong. Trumpeter Joe Magnarelli (Harry Connick Jr., Ray Baretto), rounds out the band on 2 tracks, showing his melodic range. As Chris says, I wanted to bring this group together, not just because of my respect for them as players, but because as people, our personalities all fit so well together. I wanted to take this musical journey with people I could trust, and who would challenge me as a musician and composer.